From the author of the popular "Quick & Easy Thai" come these 75 oh-so-delicious recipes for every level of cook. Though it shares certain culinary traditions with its Asian neighbors, Vietnamese cuisine is entirely distinct, focusing on a bounty of fresh fruits, vegetables, and herbs for signature clear, bright flavors with contrasting notes of salty, sweet, sour, and spicy. Creamy chicken curry is paired with the zesty tang of lime juice and the heat from ground pepper and chilies. Crisp, fried fish is served with a puree of pineapple-chili sauce. Delicate, rice paperwrapped summer rolls merit a rich and savory soybean dipping sauce. From snacks and soups to grilled meats and seafood to the essential noodle dishes and desserts, "Quick & Easy Vietnamese" presents the full spectrum of Vietnamese cooking at its most simply delicious. 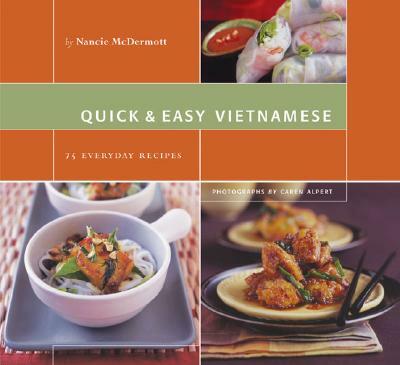 Nancie McDermott is a food writer and cooking teacher specializing in the cuisines of Southeast Asia. She lives in Chapel Hill, North Carolina. Caren Alpert is a San Francisco based photographer whose work has appeared in Martha Stewart Living, Real Simple, Gourmet, House & Garden, and San Francisco magazines.